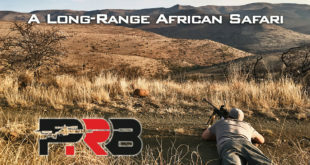 This post summarizes the results for the recoil tests ran on 20+ muzzle brakes using 6mm and 6.5mm test rifles. 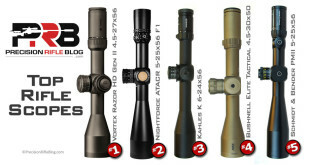 To see the full line-up of muzzle brakes tested, check out this post. The recoil data was collected using high-speed, high-resolution force sensors. For more info on the test equipment and how the data was gathered, please see the previous post. As we discussed in the last post, when someone claims a product “reduces recoil by 50%” … it usually isn’t clear what they’re talking about. Unfortunately, there is no industry standard for measuring recoil, which means manufacturers often publish whatever makes them look better. The big question comes down to what measurement most closely correlates to perceived recoil from the shooter’s perspective. Some experts lean more towards that being related to the total impulse or momentum, and others think it is more linked to the peak force. As we learned in the last post, it seems like it may be short-sighted if you ignore either of them. Honestly, I’m not here to try to convince anyone one way or the other, but simply present the data. % Reduction in Overall Momentum – This is the reduction in overall impulse or total momentum of the rifle at the end of the recoil. It represents the total “size” of the force that I described in the last post. It isn’t just the peak force, but the entire “area under the curve” when you graph force over time. % Reduction in Peak Force – This is the reduction in the highest instantaneous peak force through the entire recoil event. It’s essentially how tall the highest point on the curve is. Average % Reduction – This is just the combined average of the previous two measures (evenly weighted). To learn more about those measurements and hear the cases experts make for both sides, please read the previous post. We’ll start with the smallest caliber tested, the 6mm. The rifle used for this was chambered for the 6XC (view rifle details). I used my personal handloads for testing the 6XC, which launch a Berger 105gr Hybrid at 3,000 fps. That load is also roughly representative of the popular 6mm Creedmoor or 6×47 Lapua cartridges. 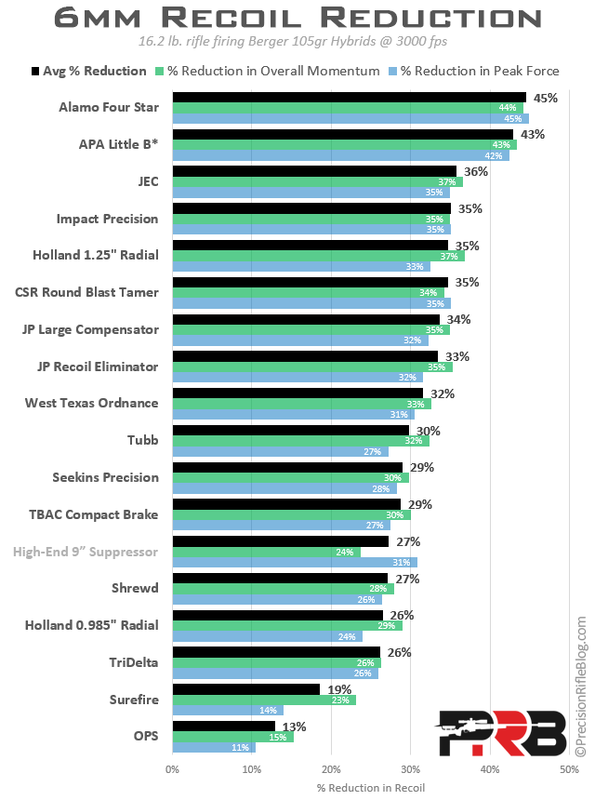 All 3 cartridges are very popular among the top shooters in the Precision Rifle Series (see the data). My 6XC rifle weighed in at portly 16.2 pounds with a bare muzzle, and no bipod or magazine. That weight includes the scope and mount shown in the photo. 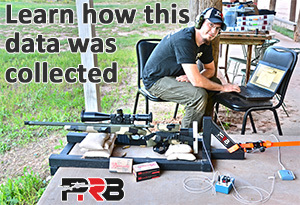 It represented the heaviest rifle in our test, although that weight is not uncommon for a precision rifle. Any surprises? I have to guess there might be a few. Let’s start at the top. There were two muzzle brakes that separated themselves from the rest of the group: the brand new Alamo Four Star Cowl Induction Muzzle Brake, and the very popular American Precision Arms (APA) Little B*. Both of those brakes had outstanding performance in terms of recoil reduction. 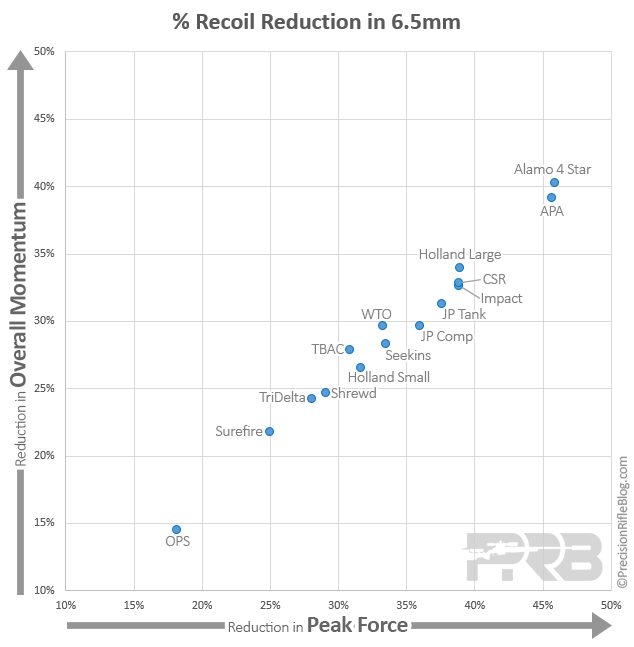 Beyond that, there was a big group of muzzle brakes in 26-36% range of recoil reduction. That is interesting, considering there are many different designs represented in that cluster. The brake designs vary by number of baffles, size of the baffles (i.e. surface area the gas has to work against), angle of the baffles, distance between the baffles, etc. Leading that group is the JEC Customs Recoil Reduction Brake, new Impact Precision Muzzle Brake, Holland Radial Muzzle Brake, Center Shot Rifle’s Blast Tamer, JP’s Large Compensator and the Recoil Eliminator, and new West Texas Ordnance Muzzle Brake. Another thing you may notice is the suppressor is more effective at reducing the peak force of the recoil (31% reduction) than reducing overall momentum (24% reduction). That means the suppressor is spreading the recoil force over time, but isn’t as effective at actually reducing the total amount of force coming back. This aligns with how I’ve heard shooters talk about the recoil with a suppressor as more of a “push” than sharp recoil. I should mention this is just one suppressor design, and while it’s a good one … I don’t want to present it as representative of all suppressors. Many are actually worse (especially if they’re shorter), and there may be a few that offer better performance. This isn’t a suppressor field test, but I just wanted to include one on this first set of results for comparison. You can see two stragglers lagging pretty far behind the rest of the group: the Surefire SOCOM Muzzle Brake and the OPS Accuracy Tuning Brake. Both Surefire and OPS design suppressors, and it could be that these muzzle brake designs were optimized to work well with their suppressors rather, which caused them to compromise on pure muzzle brake performance. However, the TBAC Compact Brake is also designed to be a Thread-Over-Muzzle-Brake (TOMB) for Thunder Beast suppressors, and it performed much better than those other two designs. That’s quite an accomplishment, considering it is almost 1/2 of their size! Regardless of the reason, both the Surefire and OPS muzzle brakes had underwhelming performance when it came to recoil reduction. Likewise, there are a lot of guys running the Surefire muzzle brake. Surefire is an established and recognizable brand in the industry, so I was surprised to see where they fell on this chart. But I fired a lot of rounds through those muzzle brakes and I couldn’t be more confident that these results represent reality, however tough that might be for some people to come to terms with. A couple sharp guys suggested I also display the recoil signatures of each muzzle brake overlaid on the same chart. It helps you visualize how each design changes the shape of the recoil force. It took some time to generate, so I won’t do it for every rifle. There is an average of 614 data points included for each line! That is some high-resolution force measurements, considering the average length of recoil was just 0.012 seconds! Click on the image to view the high-res version with more detail. I did want to point out that some of these brakes were caliber-specific to 6mm and others weren’t. Some are only available in 30 caliber. The only brake I wasn’t able to test on the 6XC was the Badger Ordnance FTE Muzzle Brake. I actually wasn’t able to test it on a few rifles, because the Badger FTE design requires the barrel to be contoured to exactly 0.800” or 0.875”. Most muzzle brakes simply screw on the threaded part of the muzzle. But, Badger FTE brakes screw on and clamp onto the barrel. For the barrel clamp to fit, you must contour the end of the barrel to specific dimensions. The reason for design constraints like this has to do with their intended user, which is the military. This brake is designed to be field serviceable/replaceable, which means it can’t use a shim kit or loctite to time and retain the brake. As long as the barrels fit the specific contour requirements at the muzzle, you could take it off one rifle and put it on another very quickly. For a precision rifle, this seems like the tail may be wagging the dog. You have to modify the barrel (arguably the most critical part of a precision rifle) to attach a far-less important accessory. 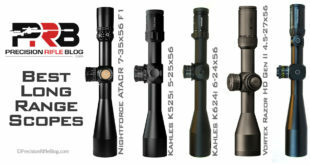 Many precision rifles sport Badger FTE muzzle brakes, so that may be of no consequence. 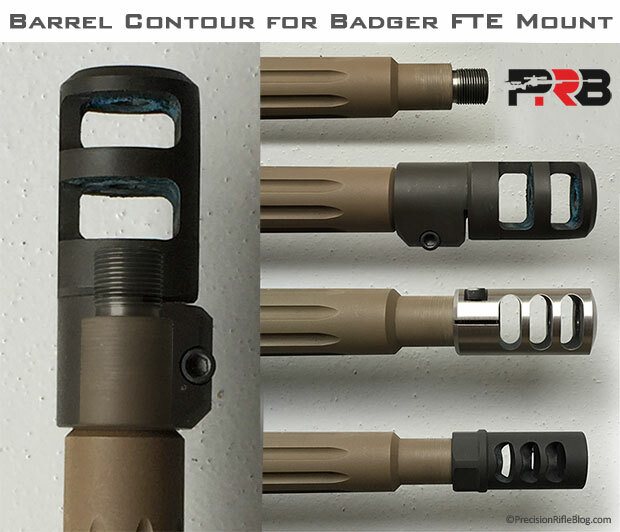 But it does mean the Badger FTE is far from a DIY muzzle brake that you can just order and screw-on. Not only does the muzzle brake have to be bored to the proper caliber by a gunsmith … you may also have to pay the gunsmith to contour the barrel to the proper diameter at the muzzle for it to work. And if the barrel doesn’t have a diameter of at least 0.800” at the muzzle, you can’t use the Badger FTE muzzle brake. It seems like a fairly persnickety design, but we’ll see if the performance makes up for that in the next few posts. Now, let’s move on to our next rifle, the 6.5 Creedmoor. Since Hornady’s release of this cartridge in 2008, it has gained quite a following in the precision rifle world. A big part of that is the fact that you can find quality match-grade ammo for around $1.20/round in 6.5 Creedmoor. To learn more about the cartridge, check out this article. For the 6.5mm tests, of course I used the popular Hornady 6.5 Creedmoor 140gr A-Max Factory Match Ammo. The rifle I used had a 22” fluted Heavy Palma barrel, which launches the 140gr bullet at 2800 fps. 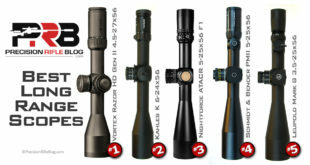 Those ballistics are similar to other popular 6.5mm precision rifle cartridges, like the 6.5×47 Lapua and 260 Remington. So the recoil results should be directly applicable to those cartridges as well. The 6.5 Creedmoor rifle weighed in at 14.1 pounds with a bare muzzle, and no bipod or magazine. That weight includes the scope and mount shown in the photo. This rifle is good representative of a typical rifle you’d see being used by the top shooters in the Precision Rifle Series, in terms of weight and configuration. 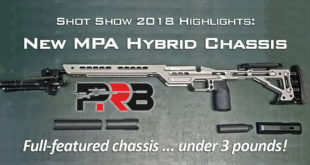 You can see the overall order is similar to the 6mm results, with the Alamo Four Star and American Precision Arms muzzle brakes still out in the lead. Once again, there was a cluster of designs in that 26-36% reduction range, and then Surefire and OPS bringing up the rear. And for the sake of transparency, here are the specific calibers of each muzzle brake used for the 6.5mm recoil tests. Remember, I only found a 1-3% performance improvement if a brake was caliber-specific, over it just being bored to a standard 30 caliber. Badger FTE Muzzle Brake – As I explained under the 6mm results, the Badger barrel clamp design requires a very specific barrel diameter at the muzzle, and it didn’t fit on this rifle either. JEC Customs Recoil Reduction Muzzle Brake – I only had a JEC brake in 6mm to test. Unfortunately, JEC didn’t return my calls or emails to try to get other sizes for this test. Did any of the brakes significantly impact muzzle velocity? Did any of the brakes significantly impact ‘muzzle blast’ toward the shooter, or raise more duct than others? No sir. No significant impact on muzzle velocity. And, yes … there some brakes directed more blast back toward the shooter. 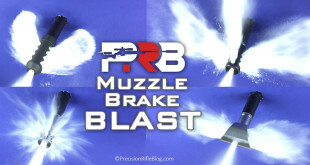 I will have a whole post on muzzle blast a little later in the series that will try to give insight into that. I caught some really cool images that will help illustrate that. So I’ll leave you in suspense for a little while longer! 😉 But by the end of this series you’ll have the full story … and probably know more about muzzle brakes than you ever wanted to know. What I’ve grown to expect from you!!!! Most excellent Sir! Looking forward to the 30 cal results. Phenomenal write up, as usual, Cal. The depth of your research-lust knows no bounds and we’re all fortunate to have you as a source. Keep it up, man! Thanks, Jeff! This test was a little over the top, but hopefully it will help advance muzzle brake designs by showing us what works best. each. For average shooters picture ” talk ” more than name. Is there a chance you could run one of the big 30’s with a suppressor to see if you still get similar performances as the 6mm test? ( maybe you have a good buddy with one of these?) looking forward to see the rest. Good work! I can probably include a suppressor for those as well. I actually don’t think I tested the TBAC 30P-1 the final time I ran through all the tests (yes, I ran through all the tests multiple times). But I do measurements for the new line of suppressors that ThunderBeast released this year. I can include that info. They actually have a little better performance than the 30P-1 design, but it should give you a context for what you can expect from what I feel like is the best suppressor money can buy. Excellent work as usual. You’re writing the only articles I wait for. I’m looking forward to seeing the new TBAC can info. I’ve a 30BAS, 30CB9 and a Ultra-9 in NFA holding. I’d LOVE to see how Zac was able to cut the noise and weight that much, plus make it stronger. Hey, Dunc. Thanks for the kind words. I’m glad you find the approach helpful. I’ve become a pretty big believer in TBAC myself. I have one of their 30P-1 cans, and am thinking about ordering an Ultra-7. They’re pretty amazing. Zak has all the data that we collected, and I think he plans to publish all of it as well. He may get to that before I can, but I will publish it at some point. I’m not sure I’ll be able to unlock the secret to how Zak was able to improve on his design like he was, but I’ll publish all the hard data I was able to collect on them. I have both recoil data and sound data. I’m just trying to work through all this data right now, and then I’ll figure out where that will fit into the schedule. I have more than a couple other things in the works, which I’m excited about. I sure get a kick out of trying to quantify all this kind of stuff. It’s fun. Plus, I get to meet A LOT of sharp guys along the way. I consider those conversations my biggest payment for all the time I put into this. There are some really great guys in this industry that have helped me out. Phenomenal write-up as always. “Just the facts ma’am.” Really important question. How do we get a couple of your hats to give-a-way at our Sept 12 Match? I know I’d rock one! Thanks for the compliments. Glad you appreciate my approach. It’s hard to leave your opinions out, but I try to be disciplined in that. I actually don’t have any caps or apparel that I could hook you up with. I ordered a couple for me personally, and they were outrageously expensive. The caps were $30 and the T-shirts were almost $50. … yeah! I’ve been trying to find a way to offer apparel that people could purchase, but I don’t have the energy to inventory and ship all that. I help run a company with 100+ employees, so that takes a ton of time and I do this in my spare time. There isn’t a lot of time left in the day to process apparel. I’m also picky about the quality of apparel that my logo goes on, so that is a little bit of a hindrance too. I think the apparel is a reflection of the brand that is on it. That is a long way of saying … sorry, buddy. I can’t help you out at this point. Very informative! Great testing and data! I’ve been running brakes on my rifles for years in order to cut down on recoil and maintain sight picture. 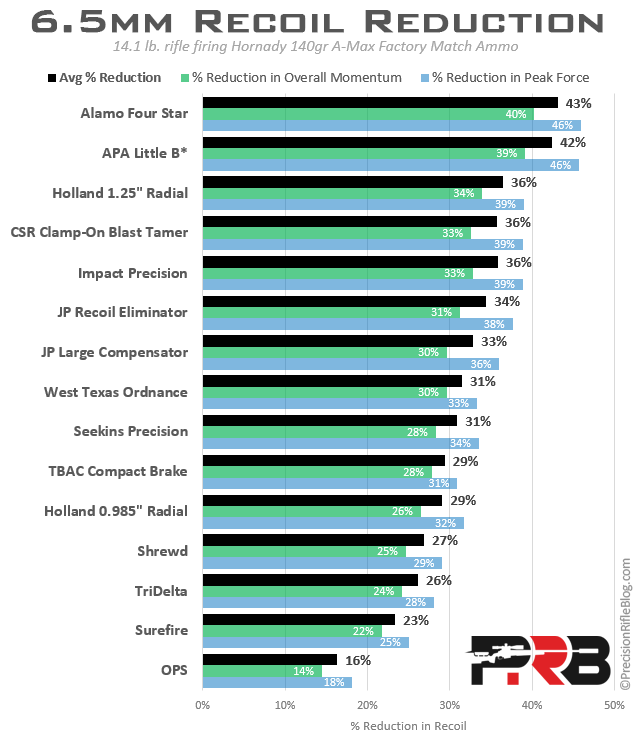 I am a bit surprised by the results in that the Four Star and APA had such a margin over other similar designed brakes…but in all the ones I have used over the years…the larger open side chamber types are more aggressive at curbing that force and my personal perception mimics your results. Thanks for the input, Anthony. Glad this aligns with your experience. I was a little surprised by the separation too, but I think a large part of that is the angle of the baffles. Both of those brakes have a unique design that send gas back at a 30-35 degree angle, and I think that is where they picked up the extra recoil reduction. Force is a vector, so angles have a big impact. Cal – another incredible write-up!!! Way to go. It’s disappointing that JEC didn’t return calls/emails on the request for their 6.5 muzzle brake. Anyway, great great stuff and looking forward to the additional test results. Yes, sir. I am as well. I wish I could have tested it on all the rifles. It was actually my phone calls with Jason from JEC over a year ago that got me thinking about doing this test. He was excited about it, but I guess he got busy or might have some personal stuff going on. I tried hard to get them, but wasn’t able to pull it off. Looking at where the other brakes ended up on the 6mm and 6.5mm, I’d expect it to have similar performance. It is a nice product. I’ve been personally using one for over a year on my primary rifle. Do I hear the topic for the next field test series? Your work on scopes was excellent and I am really enjoying the muzzle brake series so far. Keep up the great work! Well, that gets complicated with all the restrictions around them. I’m not a class 3 dealer. But that doesn’t mean it is out. I’ll probably do it at some point. I have a friend in the industry said he could get all the suppressor manufacturers to make a trip down. I may try it at some point. I did test the new line of ThunderBeast suppressors with this recoil setup and with a high-end sound meter. They’re something special. I’ll publish that data at some point, but I’m trying to focus on muzzle brakes for this series. Thank you for conducting the test, outstanding info! Awesome work as always! Forgive me if this was addressed earlier and I missed it, but I know many people and myself that have been wondering why you did not include several other popular brakes on the market today? 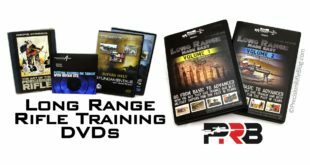 Several of which are commonly used in 3-gun, tactical training, and other competitive events. Keep up the amazing and fascinating work! Thanks! This took a ton of time for each brake, so I just had to limit the number I included. 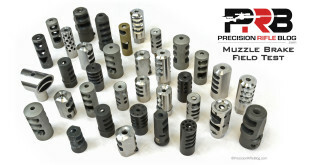 I did include every muzzle brake that more than 2 of the top 50 shooters in the PRS were using. Beyond that, I tried to just represent the wide array of designs out there. Many of the ones you mentioned are similar to some of the designs I tested, and I’d expect performance to be similar. I did see that 5.56 test, and really like his approach. There is actually a lot of great stuff on that website. I like the approach. And that is one of the reasons I focused on precision rifle brakes, instead of those popular in 3 gun competitions. There is some cross-over, but you can see there are some more popular in one discipline than the other. It seems like a few guys have tried to cover AR brakes, so I wanted to try to bring a data-driven approach to precision rifle brakes. Ultimately, it was just a time thing. And some of those are just really similar to others that I did include in the test. It seems like everyone is making their own brakes these days, so I could test them all. Hopefully this will give us insight into what types of designs are most effective, and even those other manufacturers can benefit from that. Science is so much better than internet lore. This is great stuff. I look forward to each post as I learn more each time. Keep up the great work and I am sorry you have to deal with the manufacturers phone calls (I bet their returning the calls now) disputing your science after you publish each blog. Your own words lead me to recommend your next science project – comparison of suppressors. Thanks for the encouragement! It goes a long way. I really like your approach and writeups, stellar job all around. What was the recoil in absolute terms for the 16lb 6XC/105 rig vs the 14lb 6.5Creed/140 rig, without any muzzle devices? 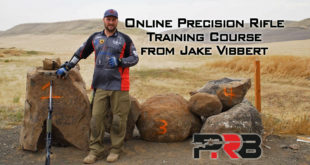 When I bench race theoretical rifle/chambering/projectile combinations recoil is one of the parameters I include, and I’ve been getting my numbers from JBM’s recoil calculator. I’m curious to see how well it lines up with your empirical results. That’s a great question, Carl. I didn’t intend for the results to be for cartridge comparisons, or I would have made all the rifles the same weight and configuration. Another thing to keep in mind is that most recoil calculations are made for free recoil (rifle is allowed to travel backwards without obstruction). My tests weren’t a free recoil scenario (stock is against a rigid steel frame), but firing a rifle from your shoulder isn’t free recoil either. 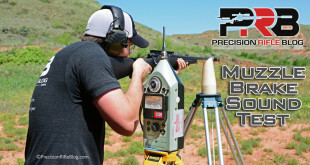 And remember what Professor Hall told us in the last post when he was talking about recoil calculations like what JBM provides: “While this method of quantifying recoil is useful, it ignores several factors that can affect the actual recoil force (felt recoil) transmitted to the shooter.” Meaning there will be a disconnect between the measured and calculated forces. Neither the JBM calculations nor my tests should be taken as gospel for what the perceived recoil would be. Remember, we can’t accurately quantify that (as we covered exhaustively in the last post), because so many things play into it. But, that doesn’t mean we can’t gain insight into it if we take an “all things being equal” approach. The problem with this cartridge comparison is all things aren’t equal. The rifle weight, stock design, barrel contour, and other things are different, and those things can affect the recoil signature. So we’re changing too many variables, and it’d be hard to isolate the real difference. You could probably do it with a couple calculations, like going from force to acceleration by dividing out the mass of the rifle … but I’ll leave that up to you to do if you’re interested in getting to that. Having said all that … I don’t mind showing you the data, for whatever it is worth. Just keep in mind it isn’t an apples-to-apples comparison. 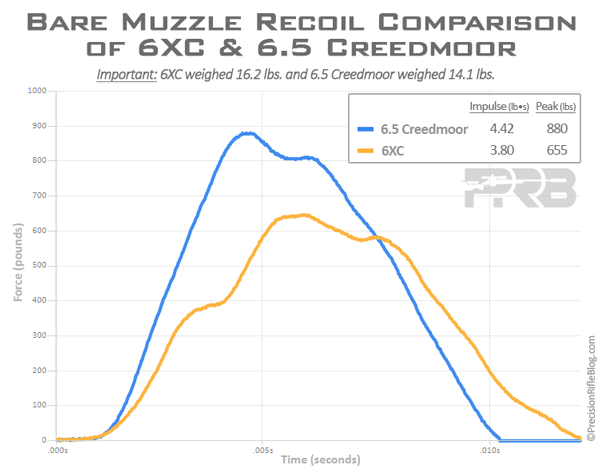 I went and calculated the recoil impulse using JBM for those two scenarios, and it predicted an impulse of the 16.2 pound 6XC to be 15% less than the 14.1 pound 6.5 Creedmoor. The measurements shown above have the 6XC at 14% less than the 6.5 Creedmoor. Although the numeric values of the measured force over time and calculated free recoil impulse are different, the percent difference is virtually identical. I know this wasn’t part of the test, but I was wondering if you have seen any significant zero shift going between breaks? Would be an interesting myth to prove/debunk, but a mild concern. Hey, Mark. I actually didn’t test to see if there was zero shift between brakes. Honestly, I always either have my rifle zeroed for whatever muzzle brake I use or my suppressor. So I didn’t think about measuring the zero shift from bare muzzle to muzzle brake. Sorry about that, man. Cal, Outstanding work on the muzzle brake study. 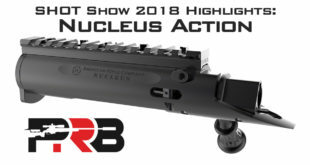 My first thought was what the Thunderbeast brake along with the new Ultra 7 or Ultra 9 might look like on recoil reduction. When you do get around to the study of Suppressors my biggest question has to do with change in point of impact between suppressed and non suppressed. Keep up the great work! I look forward to everything you publish. Great point, John. A lot of people are concerned with that on suppressors. I’ll try to keep it in mind. Incredible work, I can´t thank you enough for the significant effort you have gone thought to supply us with facts instead of opinions. I honestly don´t know how you do it, I have done a few tests of optics and since I read your optics test I realized that I should stop and re-think my approach to testing in general. Your work allowed me to just relax, enjoy shooting and direct interesting questions regarding precision rifles and optics to guys who know how to do research and approach facts in way that is interesting entertaining and highly enjoyable. Hey, thanks, Emil. I’m just trying to figure this out like everyone else! Fortunately I’ve been able to meet some really sharp guys with various backgrounds and PhD’s that I can go to with questions on different stuff. They make my ideas 10x better. I certainly can’t take credit for all of it. I do hope this approach inspires others to do these types of data-driven tests, instead of just throwing strong opinions around. As I’ve said in the posts, I was surprised by a lot of the results. That means it wasn’t what I expected, I had some bad assumptions … And I actually learned something I didn’t know. That’s what this is all about. Just trying to learn and get insight into this stuff … One test at a time! I study and enjoy your every post. I have come to believe that at the end of the day my old bones will be grateful to you and your research by allowing me to reach the apex of my ability with a minimum of physical discomfort. We dont talk much about physical limitations in this sport but they are an ever present and growing concern. For some its our eyes and for others it’s our joints. As a competitor, sportsman and long range enthusiast, I am always looking for the ability to train longer . I would wonder out loud if the reduction in recoil you have demonstrated was significant enough that it would allow an old shooter like myself to move up to the magnum cartridges without getting beat down by the recoil? Like would an effective 308 brake mimic the recoil of a 243? Absolutely, Steve. Great point. The guy who taught me how to hunt and reload, and really passed on the passion for rifles to me, is now getting older and isn’t able to shoot rifles with a ton of recoil any longer. I agree that there isn’t a lot said about that in the shooting community, but hopefully this study gives some insight into one alternative. 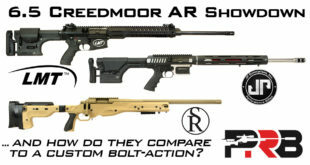 I don’t want to get too far ahead of myself, but the monster 300 Norma Magnum rifle with a good muzzle brake had about the same recoil as the 6.5 Creedmoor with no muzzle brake. That seems ludicrous … but it’s true! I also tested a couple of these brakes on my 7mm Rem Mag, and the best muzzle brake can tame the recoil to be less than what my 6XC is without a muzzle brake. Brakes work by redirecting gas, so it makes sense that the more gas a cartridge produces … the more benefit the brake can potentially provide. So a good muzzle brake is able to do even more work in our favor on a magnum than a smaller cartridge. If you want to stretch out and get longer range, I’d highly recommend the 7mm Rem Mag (or similar 7mm magnum). There are some outstanding, high-BC bullets for the 7mm … that aren’t near as heavy as what you’d need to run in a 300 or 338 to achieve the same level of aerodynamics. 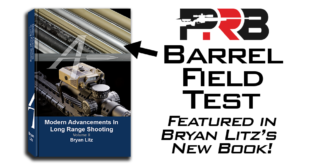 Take a look at it’s ballistics compared to something like the 300 Norma and 338 Lapua … and look at the recoil you have to endure to achieve the same down-range performance. The 7mm Rem Mag is a winner if you want something supersonic out to 1600 yards (I’ve even hit targets at 1 mile with mine) with relatively mild recoil when used with a muzzle brake or suppressor. And I’d suggest getting a heavy rifle. That can go a long ways to reducing perceived recoil as well. Theoretically, if you got a rifle that weighed 1 ton … there would be virtually no backwards movement. Now that isn’t reasonable, but get it as heavy as you can reasonably carry from the car to the shooting location. I’ve found heavier rifles help me shoot better. I think they dampen the micro-movements as you fire the shot. It just takes more force to move the direction of aim, so I can hold more steady. Thanks for all the hard work you put into these projects. Your research has really been helpfull to me as a newbie to the precision rifle world. 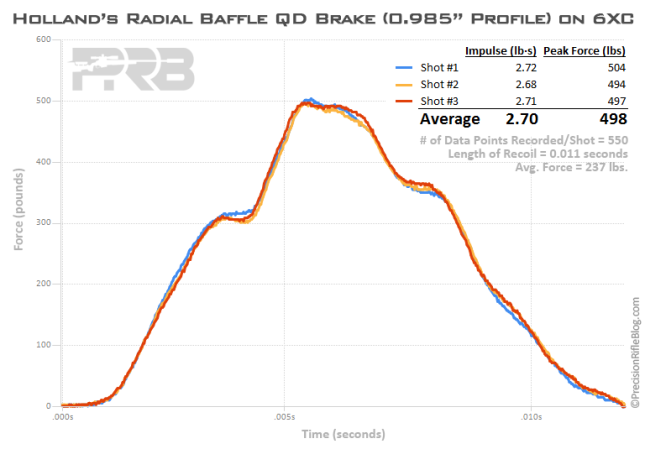 You published the recoil signatures of the 6mm and it looks like you can get a reduction of recoil force from between 600 and 700 lbs with no brake to between 300 and 400 lbs with the “average” brake. Without publishing the 6.5 signatures, could you tell us how the 6.5 mm compared to the 6mm in actual lbs of force? I’m just curious as to the difference in the actual recoil between the two calibers running your loads (with and without brakes). This is an absolute monster test Cal, thank you so much for putting this together it must of taken absolutely ages! Hi Cal, great series. I wanted to ask before you post the .30 caliber results if you’ll be including the Lantac – since some .30 caliber units were included in these 6-6.5 results but many others were not. As you’d said, the real dynamic occurring is a proclivity for rotation .. rather than the recoil per se. That rotation could be mitigated by a specific (probably a per-cartridge design) neutralizing downward push .. or by removing enormous rearward push .. or by leaning into the recoil enough to limit any initializing motion, but that becomes more difficult for larger calibers, for continuous fire, and frankly for most lay users. Or best by all of the above, but mixing categories isn’t helpful in a comparison, obviously. 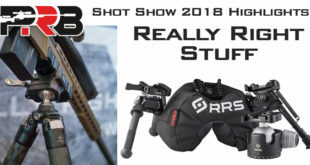 One might argue ..(or future test ,-) for that matter).. the relative merits in real world, mag-dump etc, multi-shot exercises of removing as much recoil (reward push) as possible – versus – concentrating more on neutralizing muzzle climb .. for an analogue of experienced shooters rather than single shots in a sled, – getting long-winded here, the current linear test rig could be altered into a fulcrum .. still measuring rear push, but also able to measure muzzle climb (amplitude, total force, distance) in single and/or continuous fire, I’d think one might need a replacement hand grip to use as the mounting point .. since a bench-rest sled format would tend to automatically curb the rotation – (and a trigger operating device so the rate of fire could be consistent for all units) but it’s not my meaning to visit those concepts so much as to say that the .223 and the .308 versions are more different (regarding the type of test that you have presently) than they’d seem to be on first glance and I hope to see the bigger brother included, even if the results regarding rearwards push turn out to be similar..
One the 6XC, I tested all of the muzzle brakes except the Badger (it wouldn’t fit because of it’s barrel clamp mount). On the 6.5, I tested all muzzle brakes except the ones that I only had in 6mm … and the Badger (again, it wouldn’t fit). Sorry for any confusion on that. There won’t be any new brakes appear that haven’t already been mentioned. This test is definitely in the books. I’m just publishing the findings at this point. The Lantac might be a great brake … I just wasn’t able to include all muzzle brakes on this test. It seems like there is a million out there, so I tried to include the ones that seem to be the most popular in the precision rifle community. I know that can be frustrating for guys who didn’t have their favorite represented, but ultimately … I do all this in my spare time, and couldn’t dedicate more time to this than I already did. I did publish exhaustive details on the setup, so if someone really wants to know … they could always duplicate what I’ve done here. I already did most of the leg work. It’d just be putting up the money and building a couple things. I definitely tested the two elements you’re referring to: recoil and muzzle rise. I did those separately, because some people might put more weight on one or the other (depending on the application). 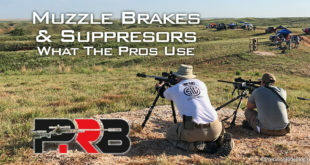 David Tubb actually helped me come up with how I tested how well each muzzle brake helps you stay on target, because he thinks that is the most important aspect of a muzzle brake. 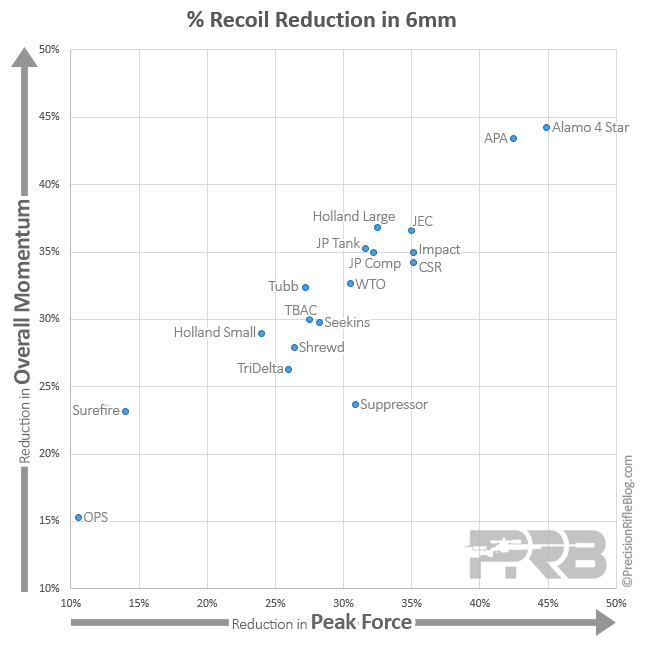 Other people only think about recoil reduction. So I wanted to present that data independently of one another, so people could draw their own conclusions based on their circumstances and personal preferences. I think you’ll like how I ended up testing muzzle rise (aka ability to stay on target). It seems pretty precise and objective. I’ve never seen anything like it being done either, and that is always fun to do something original. I wonder where the largest commercial application of muzzle brakes would have fitted into the results, the Browning BOSS. Cheers. John, I can’t say for sure how it would perform … but it is basically the same design as the Shrewd brake, but isn’t as long. So I’d be shocked if it was even able to provide as much recoil reduction as what the Shrewd did, which wasn’t great. In my view, the cool thing about the Boss is the tuning feature (which some of these brakes can also do), and the ability to turn it on and off quickly. So I’d bet you were trading in performance in terms of recoil reduction for those other two features. Also, the boss has been out for a while, and we’ve made a lot of advancements in muzzle brakes since it’s release. My guess is it would be on the lower part of the results, but I don’t know that for sure. I’ve just learned a lot about muzzle brake design through this process, and that is my educated guess. Better be careful including JEC Custom products in your evaluations. He takes your money then never delivers the merchandise. Ouch! Sorry to hear that man, but thanks for sharing it with the rest of us. I’ve had mine for a little while, but I’ve heard a couple people struggling to get orders recently. He may be going through some growth pains or personal stuff. I’m not sure. Running a business is hard, I can say that. That’s why so many fail. I’m sure you’re sick of hearing this, but as usual great work! I think (hope) I can shed some light on why caliber specific brakes didn’t do much worse. The answer to both, I think, lines up with choked flow. These brakes should do worse because they let more gases out forward instead of out of vents. For a given hole, the mass flow rate will increase as the change in pressure increase, until the gas reaches super sonic speeds across the hole. Once it reaches super sonic speeds the mass flow rate is capped out, because the fluid acts incompressible. So in our cases, the delta pressure is so high that we get choked flow and the biggest limitation is size of our holes. Lets take out 6mm bullet, which has a frontal surface area of π(6/2)^2=28.27mm^2. Now I don’t know the exact values, but most brakes use 0.5mm diameter increases. So our 6, and 6.5 mm brakes will have areas of 33.18, and 38.48 mm^2 respectively. Subtracting our bullet from the bore we get our “holes” are 4.91, and 10.21 mm^2 respectively. Meaning the larger caliber only has an extra 5.30 mm^2 for the air to move. Now compare this to the total frontal area the gases have to vent. In order for it to make a 10% difference, the area would have to start out at 53.0mm^2, or an 8.21mm (diameter) hole. Since clearly the brakes are much bigger than that, it makes sense that it was hardly 1-3%. On an unrelated note, would you be willing to publish the data you created? Wow, Adith. I’m glad there are experts like you out there. I couldn’t have produced the math to explain the results I recorded, but it sounds like you have. If you had a blog … I’d read it! I appreciate you chiming in to help us understand the physics of what is going on with the caliber-specific brakes. About the data, I feel like I’m publishing the data right now. Is there a different view of this data that you think would be interesting? Thanks Cal for all your time and effort. I find your methods and approach very impressive. I’m currently building my first semi-long range rifle and want to include a muzzle break into the project. With your article I’m now able to narrow my choices. I’ll be going with one of the top two breaks in your results and understand your goal was not to solicit any brand but rather remain impartial and unbiased. Thanks you sir for this endeavor. You bet, Brian. Glad you found this stuff helpful. I’ve been looking for a good brake for my two Ruger 6.5 CM rifles and now, thanks to your testing, I’ve found the APA Little B. Thanks for this exhaustive, scientifically designed test. It beats the heck out of anecdotal recommendations. You bet, Eric! I’m with you … the casual, anecdotal reviews are sometimes more misleading than helpful. Glad you found this stuff helpful.